MARI Company Consolidation is a tool for the financial accounting of midsize businesses or groups of companies that use SAP Business One. The add-on enables you to consolidate the G/L accounts of several companies. MARI Company Consolidation helps you to get an overview of the financial situation of a group of companies with several subsidiaries. You can consolidate G/L accounts of companies with different charts of accounts in different countries and with different currencies. The tool enables also multi-level consolidations and the consolidation of shares or opening balances. 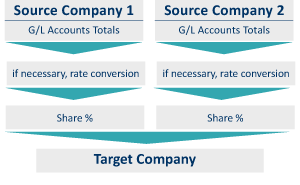 The analyses options of SAP Business One are available in the target company, for example, the balance sheet and the profit and loss account for the entire group of companies. MARI Company Consolidation can be used across industries and is available in German, English, French and Spanish. Make sure that all accounts are assigned and the data has been converted correctly. Consolidate the data with a simple touch of a button, including account assignment, exchange rates etc. The wizard displays the successful postings. Postings that failed appear in an error list. When does MARI Company Consolidation pay off? An example as a reference and orientation for your decision-making: If you have to consolidate 180 debit and credit balances each month and you need a minute for a posting, the consolidation will take 3 hours. MARI Company Consolidation, however, requires only 10 minutes. You want to learn more about the price and the fields of application in your business?